Figure A43. India anomaly, interpreted as the India slab, with (horizontal) [vertical] cross sections through (A)[D] the UUP07 p-wave) and (B)[D] the combined SL2013 and S40RTS s-wave models at 1510 km; C) the location of the modern geological record that we interpret to have formed during the subduction of the slab. The India anomaly (Figure A43) is located below India. The India anomaly was classified by Van der Voo et al. (1999b) as the ‘II’ anomaly, by Replumaz et al. (2010c) as the ‘TH’ anomaly, and it was also identified by Hafkenscheid et al. (2006), Li et al. (2008), and van Hinsbergen et al. (2012). 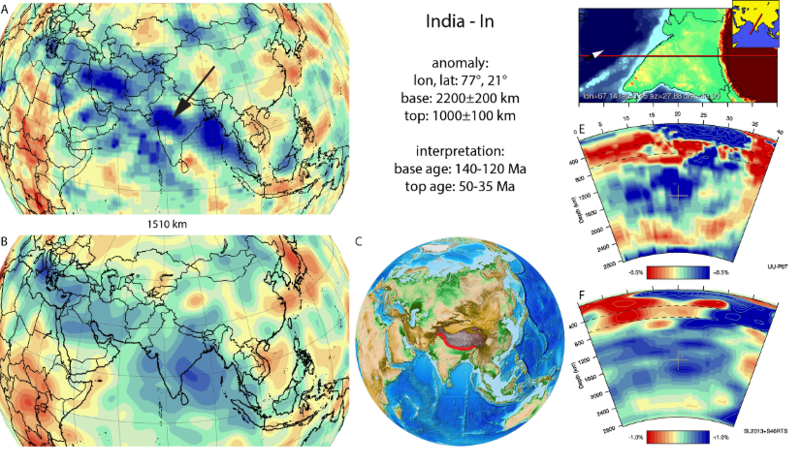 The India anomaly is widely interpreted to represent Neotethyan oceanic lithosphere that subducted below the southern Tibetan Plateau before the inception of India-Asia collision. Initiation of its subduction probably occurred after the collision of the Lhasa terrane with the Qiangtang terrane of central Tibet, which occurred ~130 Ma-120 Ma ago (Yin and Harrison, 2000; Kapp et al., 2007; Li et al., 2017). Subduction of the India slab generated the long-lived Gangdese volcanic arc on the Lhasa terrane since early Cretaceous time (Ji et al., 2009) and was associated with the formation of supra-subduction zone ophiolites in the Lhasa forearc (Huang et al., 2015; Maffione et al., 2015b). We date the base of the India slab at 130±10 Ma and note that this is a minimum age. The top of the slab coincides in age with that of the base of the Himalaya slab of 43±8 Ma, the subduction of which accommodated India-Asia convergence after break-off of the India slab.